Luke probably gives my favourite account of the lead up and birth of Jesus, he's so matter of fact in the way he writes and it suits the way I read. 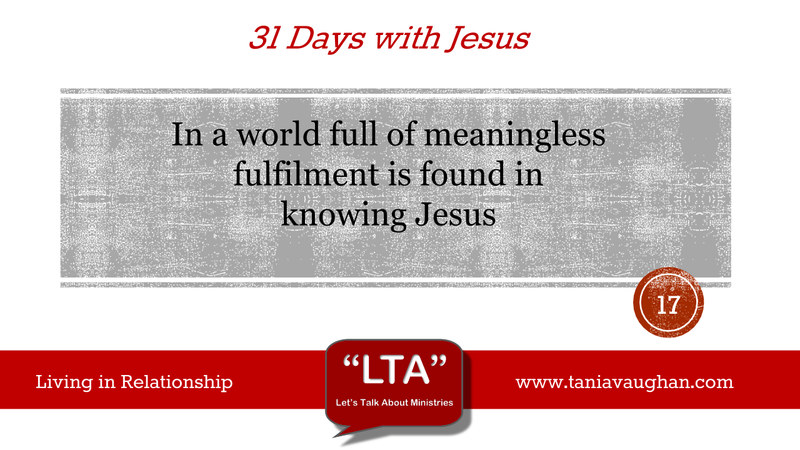 In these chapters I found the relationship that Jesus wants with us so much clearer to see. John features heavily in these chapters and his role is significant as he begins to build the relationship between Jesus and the people. As disciples you too are that bridge, preparing the way of the Lord. John made Jesus known to others before they got to know Jesus for themselves. The human spirit needs the relationship with Jesus that we have been building over this study. If you don't know or can't recognise him, you may feel that something is missing. Is there a longing and desire in your heart that you cannot satisfy? Constantly striving after one thing and then another in life hoping it will bring joy and peace leaves you feeling empty and lacking. The writer of Ecclesiastes has already done all of the striving, there are 12 chapters but I would encourage you to make the time to read them. He or they (the writer(s) is not certain) experiments with everything and finds none of it has any meaning and the conclusion is that the only fulfilment is God. There is something deep within each of us that recognises the need for Jesus. Before John was even born he recognised Jesus and leapt in the womb on hearing Mary's voice. Her cousin Elizabeth recognised her as "the mother of my Lord". Without a relationship with Jesus we live in darkness, he is the one who shines light into your life. On the birth of John, Zechariah bursts into song and beautifully describes why we need Jesus (1:79). It is for this reason that Jesus draws you close to him, he wants give you light and for you to make him known to others. The desire is already there sometimes all it takes is an invitation or introduction to start looking for more. The Shepherds, up on the hill tending their sheep, did have quite a dramatic introduction from the angels but there was no hesitation, once the angels had left the shepherds said "Let's go". They wanted to know more. As a devout man Simeon was waiting for Jesus and he recognised him immediately, He praises God saying, "my eyes have seen your salvation". He recognised an 8 day old baby as the saviour he had been waiting for. Everyone is waiting for that saviour, they just don't recognise the call of their heart. Jesus does not only want a relationship with the devout, the righteous and the religious. He wants to to be in relationships with everyone, he wants all of mankind to see God's salvation (3:6). As we spend more time in God's word building our relationship with Jesus we find the fulfilment we so long for. As you pray today listen to this wonderful song from Casting Crowns. Lord, thank you that you want to know each and every person and that you want a personal relationship with me. I thank you Lord for the person who helped prepare the way for me and ask that you would use me to prepare the way for others to come to know you. Lord, I want to know you more. Its interesting to see the relationships in play here. Between Mary and Elizabeth, John and Jesus, and even Zechariah and Joseph they must have had a rather one sided conversation about their quite unauthordox pregnancies! Even in their respective wombs John acknowledges Jesus' presence. The striking point I see in this relationship is John is sent by God to prepare things for Jesus. John is a facilitator! ie someone who works in the background to help bring about the glory of God spearheaded by another. I'm a facilitator! My job is to help others deliver and my calling from God is to help to realise God's plans for others. I chair Mission Action Team - releasing others into the mission field. Not in the spotlight but satisfied I'm working for God's glory. I'm not called to be a frontman but a wingman. Here we see John in the wilderness to prepare the way for JC. You may never be a frontman - a worship leader or powerful evangelist but you can work in the background as a wingman - on PA, as a roadie or simply driving! There is relationship in supporting others in serving God - see if you can help out helping others! There is certainly so much relationship in these chapters Gary, you're my wingman too and this ministry is possible because of your support and facilitation.